This page is intended to serve as a central place for information related to development within the Amiga operating system, to be placed or linked to. asl The sole purpose of this library is to provide standard file and font requesters for application programs. commodities Provides a simple, standardized way to program and control custom input handlers. exec Relied on by other systems to control multitasking, to manage the message-based interprocess communications system, and to arbitrate access to system resources. expansion Provides the ability to do configuration and initialization of these RAM expansion boards and other expansion bus peripherals. gadtools Designed to simplify the task of creating user interfaces with Intuition. graphics Provides ability to do graphical stuff, and stuff. icon To help support the Workbench iconic interface and manage .info files. iffparse Created to help simplify the job of parsing IFF files. intuition Provides the ability to create and control components that an application uses to build and operate a graphic user interface. keymap V37 Allows applications to inquire after the default keymap, map key codes to ANSI characters and map ANSI characters back into raw codes. layers Provides routines that are used to manage overlapping rectangular drawing areas that share a common display. mathffp The basic function library. mathtrans The FFP transcendental math library. mathieeesingbas The IEEE single-precision library. mathieesingtrans The IEEE single-precision transcendental library. mathieeedoubbas The IEEE double-precision library. mathieesingtrans The IEEE double-precision transcendental library. translator Provides a single function that converts an English language string into a phonetic string. utility The home for all the OS functions which don't fit in the other libraries. workbench Provides the ability to access Workbench arguments sent to an application when it is started, or while it is running (via drag and drop or menus). audio The audio device commands help isolate the programmer from the idiosyncrasies of the custom chip hardware and make it easier to use. clipboard The clipboard device allows the exchange of data dynamically between one application and another. console The console device provides the text-oriented interface for Intuition windows. gameport The gameport device manages access to external pointing devices like mice (two and three button), joysticks, trackballs and light pens. input The input device is the central collection point for input events. keyboard The keyboard device gives low-level access to the Amiga keyboard. narrator The narrator device is used to produce high-quality human-like speech in real time. parallel The parallel device provides a hardware-independent interface to the Amiga's Centronics-compatible parallel port. printer The printer device offers a way of sending configuration-independent output to a printer attached to the Amiga. scsi The SCSI device allows an application to send Exec I/O commands and SCSI commands to a SCSI peripheral. serial The serial device provides a hardware-independent interface to the Amiga's built-in RS-232C compatible serial port. timer The Amiga timer device provides a general interface to the Amiga's internal clocks. trackdisk The Amiga trackdisk device directly drives the disk, controls the disk motors, reads raw data from the tracks, and writes raw data to the tracks. battclock Provides access to the battery-backed clock which keeps the time while the system is powered off. 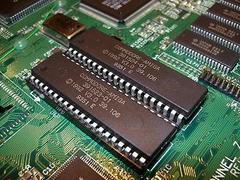 battmem Provides battery-backed memory which preserves a small portion of Amiga memory while the system is powered off. cia Provides access to the timers and timer interrupt bits of the Complex Interface Adapter (CIA) A and B chips. disk Obtains exclusive access to the floppy disk hardware. 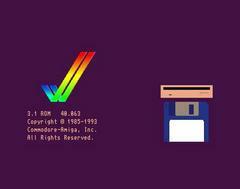 filesysres Returns the filesystems that are available on the Amiga. misc Oversees usage of the serial data port and communication bits, the parallel data / handshake port and communication bits. potgo Used to get control of the hardware POTGO register connected to the game controller ports. Amiga Disassemblies - Home of the AmigaOS 1.2 Exec disassembly. AmigaOS - The Wikipedia entry for the Amiga operating system. Reconstructing the Leftovers on the Amiga Kickstart 1.0 Disk - An analysis of the source code known to be present on the original Kickstart 1.0 disk.